Katja Henke began her new post at The Peninsula Paris on 27 June 2016. 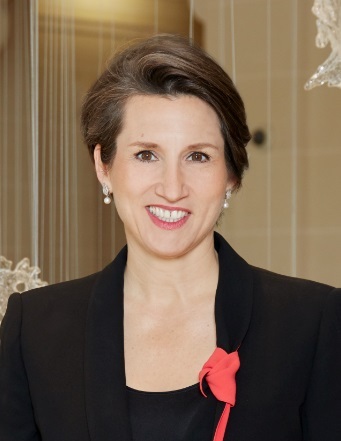 Prior to joining The Peninsula Paris, Ms Henke was General Manager at The Peninsula Bangkok for three and a half years. Katja, a native of Hamburg, Germany, started her hospitality career in Switzerland, where at age 18 she embarked on a two-year apprenticeship at the Bernerhof in Gstaad and attended the Schweizerische Hotelfachschule Luzern. Katja’s international career has also taken her to France, England and the United States, where she worked as General Manager of Blantyre, a Relais & Châteaux property in Lenox, Massachusetts. She also worked for the Four Seasons in Washington, D.C. and the Beverly Wilshire in Beverly Hills, California. Katja joined The Hong Kong and Shanghai Hotels Limited (HSH) in 2011 as Hotel Manager of The Peninsula Shanghai. I started my hospitality career in Switzerland, when I was 18. My first job was a two-year apprenticeship at the Bernerhof in Gstaad, Switzerland. This amazing experience led me to believe that the hospitality industry was the right path for me. I worked in various properties, in Switzerland, France and England, before moving to the United States, where I worked as General Manager of Blantyre, a Relais & Châteaux in Massachusetts. I also worked for the Four Seasons in Washington, D.C. and the Beverly Wilshire Hotel in Beverly Hills, following these amazing experiences, I wanted to make a change of groups and garner some Asian experience and took on the position of Hotel Manager at The Peninsula Shanghai before taking over the Peninsula Bangkok as General Manager. Social media is imperative for all businesses, just a few years ago it was considered to be too mainstream for luxury brands that now have to enter the game (the same as for the arrival of E-commerce for luxury goods 15 years ago!). However, with the key opinion leaders and bloggers of today garnering millions of followers this has changed, and we are innovating alongside them. We try to interact as much as possible with our select audience through our digital accounts. Our most responsive platform is Instagram where we find our clients particularly respond to the pictures which engages them creating a true bond to our brand. It was a huge challenge for us to open this hotel in Paris, it is the first hotel of the group in Europe and so we were bringing our Asian ‘savoir-faire’ to Europe, fusing it with the Parisian culture and creating the Palace it is today. Cultural differences, from staff and clients impacted this as well as the high expectations of the brand. Paris is one of the most competitive luxury hotel markets in the world. Room rates are some of the highest in the whole of Europe and there are new luxury hotels opening in Paris each year, just to name a few in the last few years, the Mandarin, Shangri-La; the Ritz re-opening this year, and the Crillon and Lutetia in the years to come. The challenge is creating a place for yourself in the market, and making yourself distinct from the competitors. It was and is important for us to keep our Peninsula heritage but also be seen as a Parisian Palace. Undertaking the restoration of this incredible building on Avenue Kléber gave us this responsibility, and we hope to have lived up to it today. The concept of The Peninsula Hotels, the oldest hotel group in Asia is to have one hotel, in the best location in gateway cities. Location is key and it actually took us more than ten years to find our location and building. We wanted to bring back to Paris the Parisian Palace it once was, whilst keeping the soul of a Peninsula Hotel. For our first two years our key objectives were placement into the French market, ensuring high service to match our beautiful product. These two objectives were rewarded recently through the award of Palace distinction we garnered last month. Our daily aim is to surprise and delight our guests with a stunning hotel providing exceptional service, we hope that this will make our regular and loyal guests see it more and more as their Parisian home away from home. Success is constantly surprising your clients with new initiatives, exciting events and happenings at the hotel, whilst keeping consistency in terms of an excellent hotel product and amazing service. I recently confirmed a partnership with Le Bal des Debutantes for their 24th edition, in celebration of the couture and media premières of twenty international débutantes from renowned families. This prestigious international event will create some buzz about the hotel at international level and to establish itself as a glamour palace... Also, in the long run, raising international awareness of The Peninsula Paris and also to drive competitiveness, revenue, and profits. During my time working at The Peninsula Bangkok there was political turbulence with an extended period where the occupancy levels throughout the city were extremely low. This is a huge challenge as a General Manager. You need to ensure that the team feels safe and assured that you will not be reducing the size of the team, whilst also simultaneously ensuring that you make the most of this time. We used this period to our advantage to cross-train the team and organize team-building activities to ensure that they felt valued and that all training needs were met. In today’s world people want a memorable, human experience. The most enjoyable for a client is to receive a product or service that no one else could experience – to make them feel unique. Once we had a guest staying with us who cried when he discovered a frame with his favorite Instagram picture in his room. He had taken it in New Zealand and told one of our team members how memorable was his stay there. We always try to exceed the expectations and surprise guests – to make their stay unique and memorable. I believe in investing time in people, meeting with my team frequently and learning from their day to day work and passion and what we’ve done to make our clients feel extra special. I can easily spend the entire day out of my office, listening and sharing views and experiences on this wonderful industry we work in. Be a people person who is passionate, flexible and has a “can do attitude”. Our job is about people and cultures, so we must be “culturally competent”. This is the true richness of the hotel industry. I have lived and worked in many different countries during my career and each experience allowed me grow, not only professionally but also as a person. If you want to succeed, your expectations, dreams, ideas should have no limit. If you are not passionate about what you do, you will not achieve true success. I never work as my job is my hobby and lifestyle! It requires you to give a lot of yourself but the rewards are priceless.